Posted in: Daily Posts. Tagged: Bridge Photography, HDR Photography, landscape photography, Photography. Happy Thursday. Back to the archives today for an image I shot on February 22, 2013. I was coming back from Cedar Rapids and have often thought about shooting this scene but never got around to it. 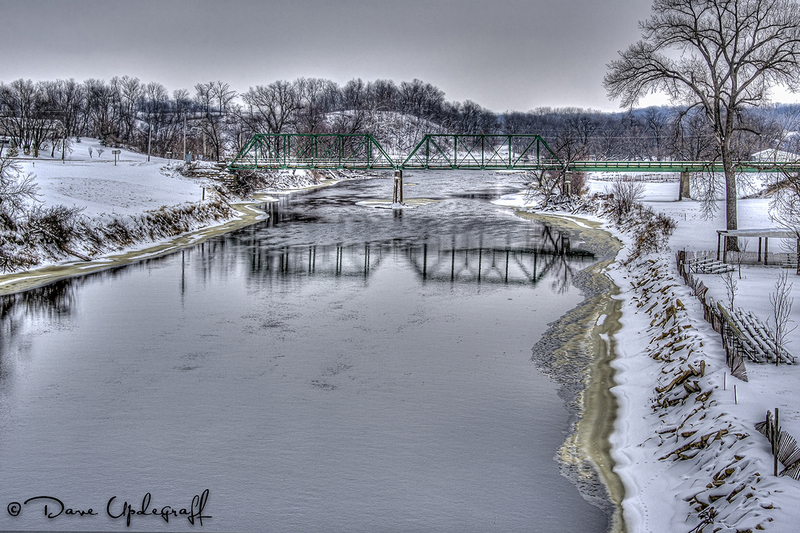 It was a cloudy, gray, overcast day and so I stopped on the way back to Maquoketa and shot a few images. I used a 3 shot bracket because of the lighting conditions and I don’t remember now why I didn’t use this image before. I did give it a bit of an HDR look and some folks don’t like that I know. Sometimes I do and sometimes I don’t but in this particular case I do. One thing that makes this day stand out for me is it was the day that my new Nikon D4 arrived. In fact it came about 15 minutes before I needed to leave for my meeting in Cedar Rapids. I just remember how hard it was to leave that box on my desk and get on the road. I also want to see if the eagles are flying and fishing this weekend. That’s it for today. It won’t be much longer before there is enough light after 5:00 p.m. for me to start shooting again. I hope you enjoy your day. Thanks for stopping by the blog and be careful.